September Hawthorn berries on the edge of our upper terrace. 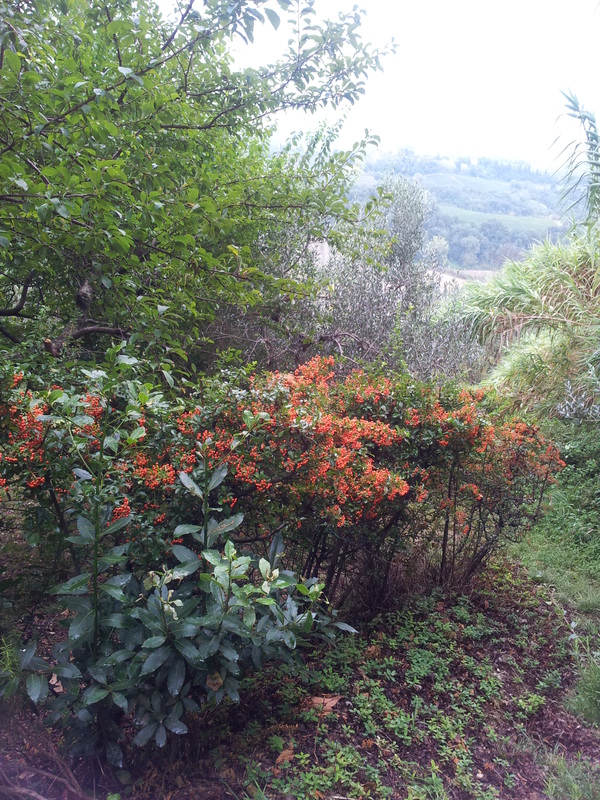 This morning, I am writing to you from Beautiful Tuscany and feeling a little under the weather. This is nothing to do the weather outside; in fact it is luke warm and sunny, gorgeous in fact. No, I over indulged in Verdure Sott’olio yesterday, which simply means Vegetables under oil. However, Sot’olio is often and usually is, a very hot spicy oil prepared with chilli peppers and garlic. Lesson learnt. Back at Laura’s Bar/alimentare in Fiano, Sig Rotund is again pinching the Sporting paper from right under the nose of an old boy who was still reading it. He sits down at the same table pulls his T-shirt up, exposing his over generous belly to clean his glasses, and starts reading. The old boy smiles approvingly, as if Sig Rotund is royalty and appears pleased to have the honour of having his reading session interrupted so rudely. Meanwhile, Laura takes a plate and flops a generous mound of ricotta on it and covers it with sugar. She sits down at an adjacent table to eat it. She sees me staring and shrugs, “It helps to keep me going, now that I have given up cigarettes…” she says, in Italian of course. I blow out my cheeks and hold my hands out in front of me giving the impression of a big stomach, well bigger than the one I already have, and she nods, stuffing another big spoonful into her mouth. Last Sunday was Laura’s thirty-fourth wedding anniversary and when I asked if she celebrated with candles and amore, she shrugged and shook her head. Her man is very nice but has the speed of a striking slug, bless him. Locals are still parading around with suntans that range from bright orange to dark chocolate-brown. The beginning of September is the return to work after the August break and the Italians are very proud to be sporting evidence of their visit to the seaside. This year however, the weather has been awful with a lot of rain and cold winds. But the sea air usually does the trick anyway. The tourists are now very grey haired, as the children return to school and the oldies come to Italy. Particularly from England. Now, it is rare to meet an interesting English grey head, but we did have fun with a couple who were introduced to us in the restaurant by Gianluca the waiter. The husband was a Londoner and a driver/chauffeur for forty years and had some fun stories about that. His lovely lady partner was his third wife and he explained that his first wife died from too much alcohol. “I went down the pub, got filthy drunk and went home and shot her!” he said very seriously. “Then there was the time I met Princess Anne. She said, ‘are you local?’ No, love, I said, I was born just down the road from your Mum.” If you guys are reading this, it was fun to meet you both! Some English can be very rude in restaurants. Most of you will know that this is the land of slow food. Wine, water and bread will arrive quickly, however, the rest is cooked to order. Last sunday a family of four arrived in the busy restaurant and were shown a table. We could see from our vantage point that they were not comfortable with the normal loud conversation and busy atmosphere. Within ten minutes, they upped and left without cancelling their order, that kind of behaviour really annoys me! But enough of that. I am so lucky to be surrounded by music, words and amore. Amore being my man, of course. 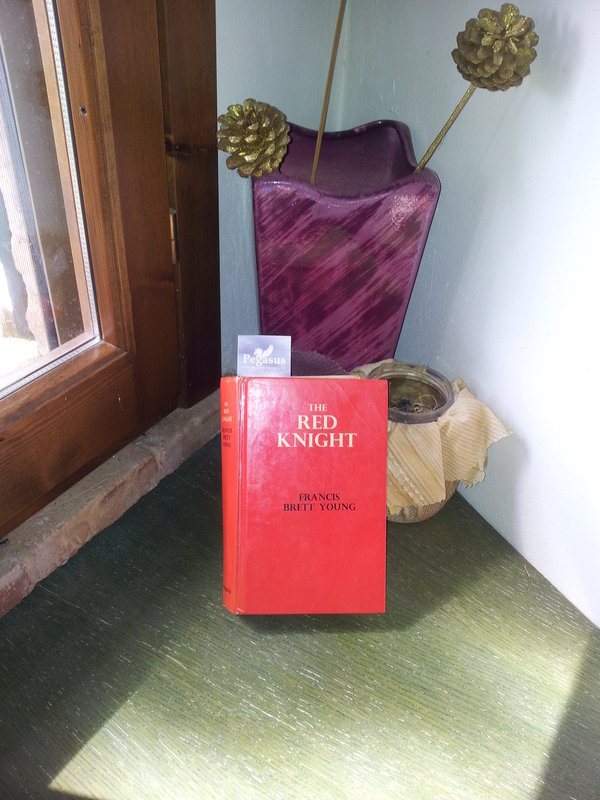 We both read a lot and he is currently deep into a novel called ‘The Red Knight’ by Francis Brett Young, first published in 1921. There is a prolific use of adjectives and adverbs in this book, like many others of that time and indeed up to the sixties, and the words are just beautiful. ‘Mellifluous’ is the best word to describe this style of writing, which means ‘sounds and utterances that are rich and harmonious or flowing with honey or sweetness.’ Sadly, modern readers and writers no longer appreciate this style of writing. I find this very sad, however, I somehow try to write with some compromise in both directions. A few years ago, the first literary agent who looked at my initial attempt at getting a novel published told me to cut out all the adjectives and ‘modernise’. What do you think? 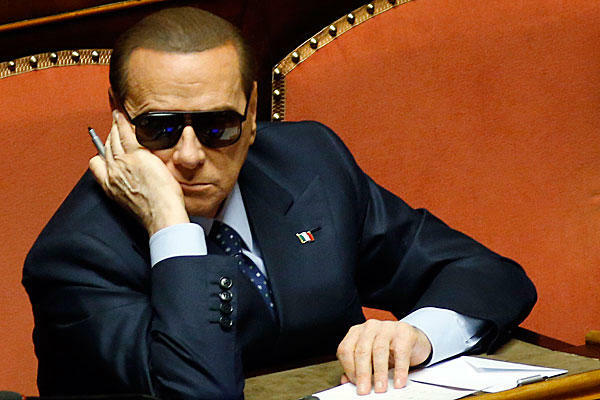 Well, hello again to Silvio Berlusconi, who has just popped his perfectly made-up face, topped by his neat rows of hair implants, above the parapet. It seems he did recently attend a football match between AC Milan and Lazio. He also flew to Reykjavik where a local taxi driver told him that the only thing likely to make the earth move there was the eruption of the volcano Bardarbunga. SB was also spotted fiddling with a discretely hidden hearing aid. News also has it that Toto Riiana, an imprisoned mafia man, was overheard saying in the prison yard, that SB paid the Sicilian Mafia protection money between the seventies and the nineties. Well, perhaps no surprise, but at least things are getting interesting again! I am getting on well with the ‘Bolivian Connection.’ I am hurtling away with the storyline and will go back to fully painting the picture when I have finished. It’s rather like going back to the beginning of a ‘Painting by Numbers’ book; the drawings are all there, you just need to pop in the colours. I used to love those books and canvases when I was a girl. Well, enough of that. 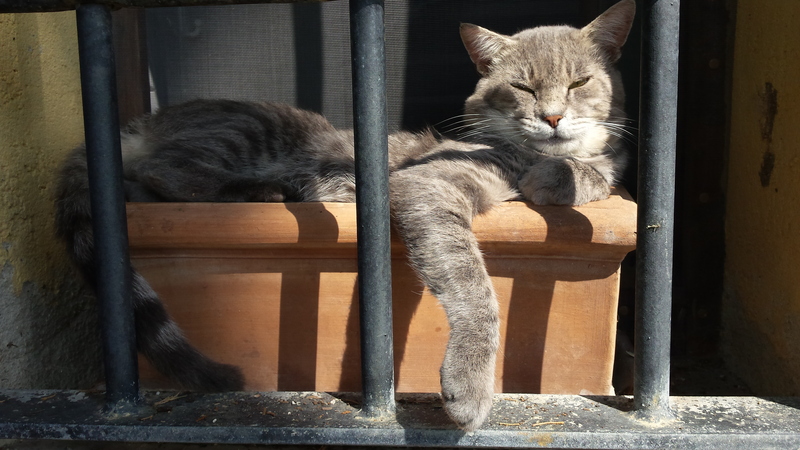 Farty Barty is enjoying a bit of sunshine in his favourite terracotta pot and it’s time to check my emails.